It is probably one of the oldest ways of harvesting energy from wind. The first time windmills were used to produce electricity was in 1891 in Askov, Denmark by Poul la Cour. We had to wait until 1930 until someone came up with the idea of locating wind turbines offshore. But it wasn’t until 1972 that Dr. William E Heronemus, professor at University of Massachusetts, introduced the concept of using floating wind turbines. The first real offshore wind farm was constructed in Denmark in 1991. And the first floating wind turbine became operational in 2009. So it took more than a hundred years to deploy them. We need more and more energy and our traditional sources of energy are not sustainable. As this becomes more and more a pressing matter, wind energy is gaining in popularity. But you need to make sure you capture the wind in the best places. Offshore wind turbines have the advantage that wind and space is abundant. Bottom-fixed offshore turbines can be deployed in shallow coastal areas. But these are often densely populated. Floating turbines allow harvesting wind energy further away from the coast. This has several advantages: the wind is stronger and more constant, they reduce visual pollution and they accommodate fishing and shipping lanes better. There are four ways a floating wind turbine can be conceived: Spar-type, tension leg platform (TLP) type, pontoon (barge) type and semi-submersible type. They distinguish themselves on the amount and position of the floating elements as well as the way they are anchored to the seabed. The spar-type you have to envisage as a windmill with a floating element at the bottom. It’s anchored to the seabed with several lines. The TLP looks more like a oil drilling platform with a windmill on top of it. The pontoon type looks more like a boat with several windmills on it to keep it balanced. And the semi-submersible is similar to the TLP but it has a system to keep it level in the waves. The main challenge is an economical one. Unlike onshore wind farms, the main cost is not the turbine (only about one third). The support structure accounts for about one fourth of the cost and operation and maintenance another fourth. Each type of wind turbine mentioned above is suited for different conditions. This depends on sensitivity to waves and bottom soil conditions (to attach the windmill). This also influences the mooring line system and anchor cost. Also water depth independence is key. Since 2009 several systems have been deployed and their financial viability still needs to be evaluated. The power the turbines can generate is similar to the fixed wind turbines as the designs are the same. The only limitation is the size, as you need to be able to keep it stable in the waves. Turbines up to 6MW are currently being deployed. The countries that have deployed floating wind turbines are Denmark, Italy, the Netherlands, Norway, Portugal, Sweden, the United Kingdom and the United States. Japan is also planning to install a wind farm off the coast of Fukushima. Europe clearly has a leading role and this is also the case for the non-floating offshore wind farms. A lot of projects are still planned. As mentioned, Japan is deploying a big wind farm that could have 80 turbines by 2020. All of the examples above are still in the pilot phase. The State of Maine plans to build the first commercial floating wind farm. 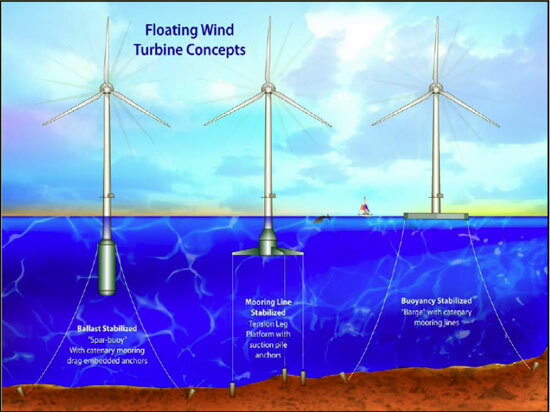 So far the concept of floating wind turbines seems technically viable. If we want to rely less on traditional energy resources, we will need this extra energy capacity. Time will tell whether this is also a commercial option.